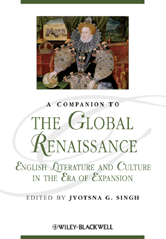 Featuring newly-commissioned essays, A Companion to the Global Renaissance: English Literature and Culture in the Era of Expansion demonstrates how today's globalization is the result of a complex and lengthy historical process that had its roots in England's mercantile and cross-cultural interactions of the sixteenth and seventeenth centuries. An innovative collection that interrogates the global paradigm of our period and offers a new history of globalization by exploring its influences on English culture and literature of the early modern period. Moves beyond traditional notions of Renaissance history mainly as a revival of antiquity and presents a new perspective on England's mercantile and cross-cultural interactions with the New and Old Worlds of the Americas, Africa, and the East, as well with Northern Europe.Illustrates how twentieth-century globalization was the result of a lengthy and complex historical process linked to the emergence of capitalism and colonialism. Explores vital topics such as East-West relations and Islam; visual representations of cultural 'others'; gender and race struggles within the new economies and cultures; global drama on the cosmopolitan English stage, and many more.